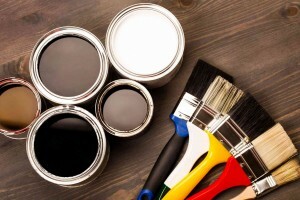 Follow this guide for when and how to use the different types of paint. The characteristics that describe water-based paint include low odor and fume levels, and a wide range of colors. Water-based paint is easier to clean with water and is less prone to cracking and yellowing. The finish of water-based paint is not as smooth as other options, and it’s also less glossy when it’s dry. However, it does dry quickly (about 30 minutes) and remains durable in damp environments. You also get better UV resistance with water-based paint. You’ll experience stronger odors, fumes, and VOC levels from oil-based paint. In addition to those odors, it also requires turpentines for cleaning, which come with their own pungent smell. Oil-based paint has a limited range of color but finishes glossier than water-based paint. It takes about eight hours to dry and is more prone to cracking. However, oil-based paint has a smoother finish when compared to water-based, and a better resistance to wear and tear. The UV resistance is lower, and it can yellow over time. The finish associated with the paint will ultimately have the biggest impact on how it will appear on your walls. High and semi-gloss finishes are the easiest to clean and the most durable. They also offer a high level of reflectivity. Satin and eggshell finishes offer mid-level gloss and are famous for being a great option for children’s rooms and spaces. Flat and matte paints are popular in contemporary homes but are harder to clean than the other finishes. These finishes look best in dark colors and are perfect for ceilings and touch-up jobs because they don’t draw too much attention. When deciding what type of paint to use, there are some considerations that you should keep in mind. First, think about where the paint will be applied and if it will need to withstand a lot of wear and tear from high traffic or children. Also, think about the amount of moisture in the area and how durable the paint needs to be.